it’s all natural ingredients and it’s made with my favorite beer too. Considering that St. Patrick’s Day is this week; I’m sure you’ve seen a million different ideas on how to celebrate this International holiday through food. Did you know that Corned Beef and Cabbage is not a big deal in Ireland? Nope…they’re more likely to serve Colcannon on this day honoring St. Patrick. 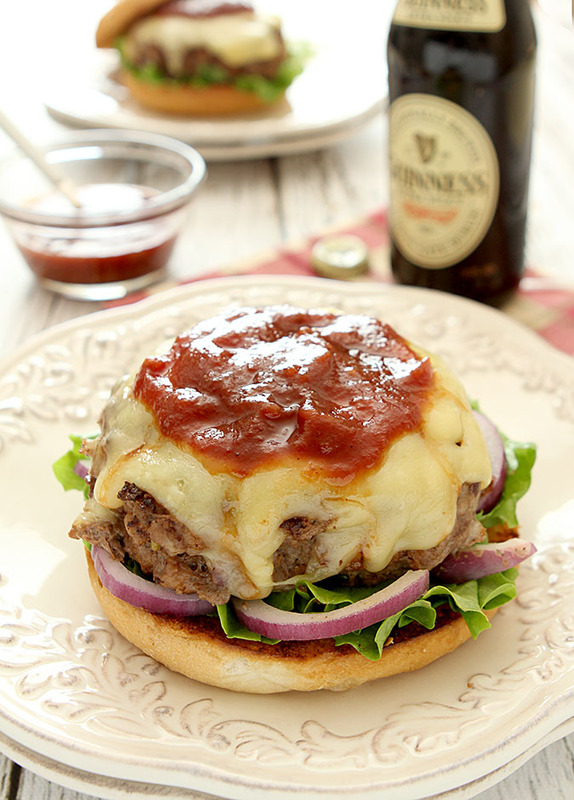 I’ve got a tiny bit of Irish blood in my veins but I’m not alone in wanting to join in the celebrating and really…what better way than for this totally American girl to include a touch of Ireland in an American favorite? 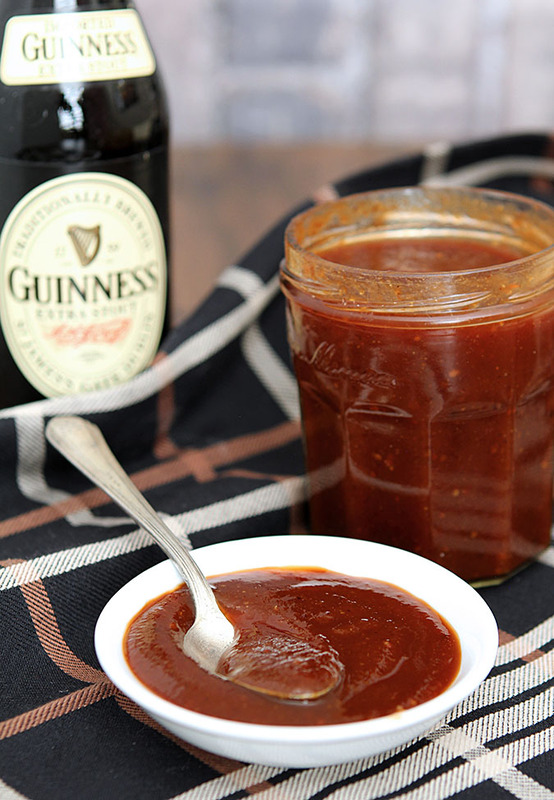 So I’ll make one of my favorite burgers (posted on 3/16/16) and include this Homemade Guinness Irish Stout Ketchup in the mix. If you know me at all that might come as a surprise. I’m not a ketchup fan. I love tomatoes; just not ketchup. I’m that person at the fast food drive-thru who has to have her cheap, plain, single McDonald’s burger with double the pickles and hold the ketchup; girl’s got standards you know? So when a company asked me to review a ketchup product a few years ago I was curious but to be honest I didn’t hold out much hope that I would be impressed; it was after all just ketchup. I was pleasantly surprised. The nice people at Ballymaloe sent me a couple of samples. Their regular ketchup and one with stout. 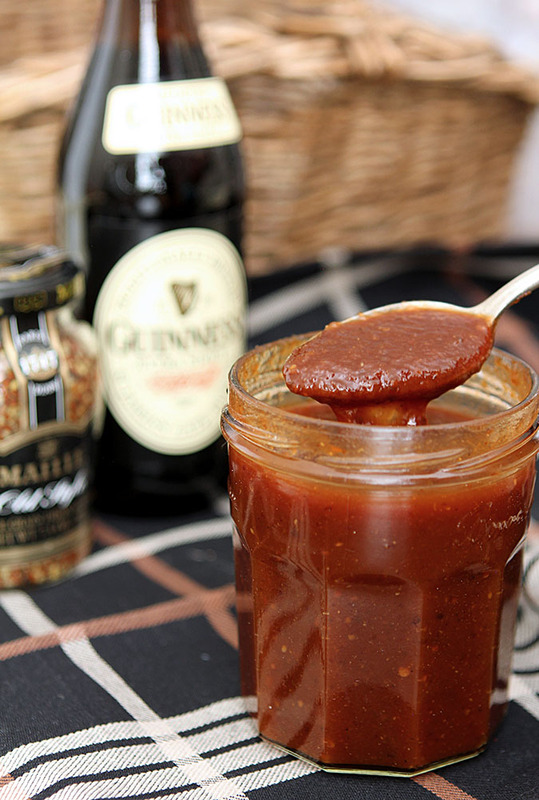 I’m not sure I had even discovered how much I loved Guinness at that point but I do remember this…the regular ketchup was much better than the norm and I sure loved that the ingredients were natural and more varied than just tomatoes and high fructose corn syrup so we were off to a good start. Still, it was that stout version that woke me up. So good I could (was) eating it by the spoonful. Fast forward a couple of years and I still love that ketchup but it is a royal pain to find. The only place I’ve found it locally is Cost Plus World Market and it’s seldom been on the shelves when I’ve gone in to shop. My last foray I left empty handed so once again I had to order online and in that moment, after I finished my order, I realized something had to be done. $5/bottle for only 8 ounces and shipping on top of that? I always ordered 4 bottles so I was paying $25 every time I wanted my ketchup fix. Ouch. I’m not unhappy I placed that order though; it was good to have some on hand when I tried to recreate it. While the bottle does list ingredients that’s really not much help since there are no quantities which can mean a lot of trial and error. Beyond that? What the heck is stout extract? I had the real deal so I was going to have to improvise. Luckily the story of Ballymaloe is not unknown. Ballymaloe is nestled in the southeastern part of Ireland in a 15th century Norman Castle and the Ballymaloe Country House Hotel was opened by Mrytle Allen in 1964 and continues to be run by Mrytle’s daughter Yasmin as the Ballylamoe House and Cookery School where guests are still welcome and their products are produced. I decided to dig a bit deeper and see if I could find additional information on this ketchup before starting in the kitchen and I struck gold. Myrtle Allen produced a cookbook in 1981 called The Ballylamoe Cookbook which included a tomato/sultana chutney that many thought to be the basis for their Ballymaloe Irish Ketchup. I discovered that recipe in a chatroom discussion from years ago and decided to use it as a start for my foray into replicating this Irish gold. I’ve made a couple of revisions; Myrtle’s recipe for a chutney called for green onions and I thought regular ones would do. I also thought it just a bit too sweet so I added additional whole grain mustard and some cider apple vinegar. Still…most important of all was the addition of the Guinness Stout. That’s when it turned the corner. Does it taste like the bottled version? It’s very similar. Was I happy with the results? I think I like it better so yes I am REALLY happy. I am hooked and hope you will try it. It’s not a product that I’m canning for longevity but I’m betting once you taste it you’ll agree there is no need; it will vanish quickly. My leftover cold hamburger today was sure fantastic! Check out my post tomorrow for the recipe for the burger that started this whole thing years ago. Seriously one of the best I’ve ever had! In a large saucepan, heat the olive oil and add the chopped onions and saute them until they soften and become translucent. Add the remainder of the ingredients; setting aside 1 Tablespoon of the whole grain mustard, and bring to a boil; simmer for about an hour until thickened to a jam consistency; longer if necessary. Either use an immersion or countertop blender and blend until just slightly chunky and thick. Add the additional tablespoon of whole grain mustard and simmer for 5 minutes. Remove from heat and allow to cool before pouring into a container. Refrigerate. Use within a couple of weeks.